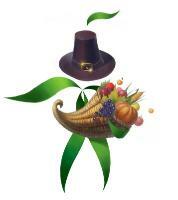 Happy Thanksgiving to our American friends celebrating the holiday! As we take time to give thanks and celebrate with family, it’s also a time to reflect on how we’re thanking our supporters. So following our tradition of commemorating both the American and Canadian Thanksgiving, here are some thoughts and a round-up of insightful posts on the impact of saying thanks to supporters. Is saying thanks the key to retaining supporters? So how can you retain existing donors? Back in September, we looked at the issue of donor retention (in our post Giving Donors What They Want) and the debate around how to keep donors, especially online donors engaged. In the post we discussed the fact that as Julie Damon suggested in Move your Online Donors Offline? You Must Be Crazy (Branded Out Loud), “the real issue with online donors being one-hit-wonders isn’t that the donations are made online, but that many nonprofits don’t have a great process in place to retain donors that are NOT obtained through direct mail campaigns.” We agreed that it isn’t just about the medium, it’s also about the message. Donors - whether they give online or off - want to receive a heart-felt thank you as well as hearing about the impact their donation made. Check out Joanne’s other tips for saying thanks - here. Speaking of gratitude, a great blog post by Katya Andresen suggests that there’s a lot more to saying thanks or showing gratitude than simply retaining supporters. So - saying thanks and showing gratitude to supporters (as well as our families, colleagues and friends) can have a huge impact on our world as well as on your organization's fundraising and donor retention! For additional insight on "Cultivating an Attitude of Gratitude” be sure to visit Pamela Grow’s Blog after Nov. 27th for her Nonprofit Blog Carnival round-up for November.